It would be difficult to tell how much Primitive Methodism owes to the unique and striking personality of its local preachers. To this order belongs Mr. James Saxton, born at Hucknall Torkard, March 18th, 1832, he became a member of our church at that place, directly he was reckoned old enough to have his name on the Roll book. The son of godly parents, he owes the beginning of his religious life to their teaching and influence. Carried by his mother to a Primitive Methodist class meeting, he may be said to have grown into the “Faith”; the seed sown by his pious ancestry being nurtured by an atmosphere genial and productive. He still has vivid recollections of those early days, and remembers with with perfect clearness receiving his first Class Ticket from Rev. J. Hirst; and the first exhortation addressed to him: “ The lord bless the lad,” his youthful response being “This people shall be my people and then God shall be my God,” and from that time he has been a loyal servant to the church that gave him his first spiritual counsel and home. At this time Hucknall belonged to the Nottingham Circuit, which was now entering upon a period of extension and aggression; workers were required both in the home churches and in the wider field of Circuit life, and Mr. Saxton began what has been a long and honourable career of usefulness, in the Sunday school; for twenty years he was superintendent; but having a “Note of Authority“ from the “Quarterly Meeting” he also took occasional appointments in the neighbouring villages; and as he naively puts it, he not only took the services but took his dinner with him also. As the church at Hucknall grew and more workers were available, he was at liberty to devote more time to preaching, and in the year 1879 became a preacher on Full Plan. “ These Saxtons are born preachers,” said an old Veteran to me, after having heard the two sons, Rev. J. H. Saxton and Mr. C. H. Saxton our able Circuit steward preach, the father has the gift and the sons have caught it: and this seems to be the truth of it. Mr. James Saxton has the gift for preaching. He, is blessed with an extraordinary memory, a considerable fund of humour, a vivid imagination, fluency of speech, and more than ordinary powers of deduction. James was baptised on 25 March 1832 at Hucknall Torkard, Nottinghamshire. His parents were Charles, a frame-work knitter, and Sarah. James worked as a frame-work knitter, later specialising in elastic bandages. 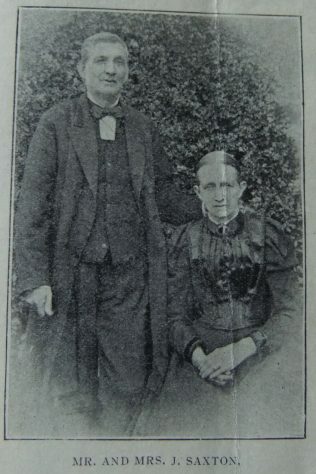 James married Mary Hutchinson Daws (abt1833-1918) in late 1862 in the Nottingham Registration District. Census returns identify five of six children. James died in the spring of 1911 at Hucknall Torkard, Nottinghamshire.